I've just concluded a pretty terrible experience with an eBay seller szubaark who is either known as Wes Szuba or Arek Szuba and is either from Florida or Michigan (the confusion is because my PayPal transaction was with an "Arek Szuba", but the return address on the two packages I ended up getting from him was from a "Wes Szuba." Both shipped from Florida, but the eBay auction's location clearly said Michigan. I don't really know what's going on there to be honest. Maybe two people, possibly family members, sharing the same eBay account?). This individual sold me some a Commodore 64 system that was not as described (it didn't work properly right from the get-go) and ended up blaming me saying that I had someone broken it. And to top it all off, he ended up getting away with it. I don't like to write stuff like this that has such a negative tone, but this experience has left such a sour taste in my mouth and the fact that he ended up getting away with it scot-free... I feel like I have no other recourse now but to write about it. In the very unlikely chance that someone in the future is considering dealing with him and happens to google his name first and finds this, well, I hope it helps them out. Since he essentially runs a shop on eBay (over 1000 feedback), consider this a review of his shop just like any other review of a store you may find elsewhere. On May 6th, I bought a Commodore 64 "complete system" package from szubaark on eBay. This was fairly expensive for such a system, but when you look at Commodore 64 systems for sale, they very typically are not "complete" and even if they are, they often have not been tested at all, or at the most someone has plugged it in and verified that the power light turns on... not even verifying functionality by plugging it into a TV. These types of auctions go for far less than the one I bought. But I was willing to pay a premium for a fully working and tested unit. There weren't many on eBay at the time and this one from szubaark was even modded with JiffyDOS which seemed like a nice perk (saves me the trouble from doing such a mod myself down the road!). I can hear you now: "Yikes! That's expensive!" Yup, but again, when you look at complete systems for sale that have been tested and verified working, they are all typically around that ballpark (though this was definitely near the top-end of that range). On May 17th, it arrived. Packaging all looked good to me, no need to believe it had been beaten around during shipping or anything of the sort. I opened up the package and everything that was mentioned in the auction was present and exactly as pictured. I proceeded to plug it in (just the Commodore 64, I actually to this day have not tried the floppy drive at all). It powered on and looked to be all good. I had previously bought the Commodore 64 user's guide and programmer's reference guide and had them both in hand and excited to be able to try fiddling around with old school BASIC for the first time in many, many years I began typing in some simple examples from the user's guide. I was in the middle of typing in one such example (to do with sound) and it froze. The screen didn't change, it just froze completely. Uh oh. I power cycled (waiting several seconds between powering off and then on) and it booted up fine again. I once again tried typing in the same BASIC program. Froze again. Much quicker this time (within 30 seconds or so). Though this time the screen cleared to a simple blue with blue border screen without any text or other characters visible at all. After several more crashes like this and power cycles, it began booting up to a plain blue with blue border screen and nothing else. It doesn't crash consistently. Once it did while I was in the middle of typing a small program in from the user guide and I simply turned it on and off again and re-tried to type it in and was able to finish it successfully the second time. When it does crash like this, I have no option but to power cycle it. Nothing else (pressing any keys, etc) has any effect whatsoever. However, sometimes when it has crashed and I power cycle it doesn't power on correctly. It boots up to that same blank screen as shown in the picture I linked above. In fact right now it's doing that. I was testing it all week and worked every time but this is 35+ year electronics and anything can go wrong at anytime..
Do you have a cartridge? can you put it in and see if boots? Not exactly an encouraging way to start out a reply from a seller who claims to have sold me a "tested and working" Commodore 64. Sure, it's quite old, but you supposedly had tested it. It randomly failing a mere 2-3 minutes after I take it out of the box seems unlikely to me. I would suspect that the simpler and far more likely explanation is that it simply was not tested very thoroughly (if at all). We exchanged a few more messages and he reiterated that he had tested it and mentioned that "never had any complaints until now from you...so im curious what could have gone wrong with it and right out the box"
Blank screen, no border. It can produce colored screen or flashing color garbage instead of startup screen. It can cause intermittant loss of cursor, screen freeze and/or program crashes after warmup and it can put random characters on screen. This chip normally runs hot. It is the most common chip to fail in the C64 because it runs hot normally, like the SID. I've bolded the parts that were relevant to what I had seen. Given that I had to pay a $50 customs fee which I wouldn't be able to get back without a lot of time and effort (I looked up the process just now), plus the cost of re-shipping it back to you, PLUS the fact that the C64 at least does power on and the sound does seem to work (the little power on "chime" is audible), I've been considering the feasibility of replacing something that is broken / gone bad inside it. I did some quick googling about possible problems when you get a blue screen on power on and it seems like some likely culprits are the BASIC ROM or PLA IC's might need to be replaced? I'm curious if you know anything about this? Figured I'd ask you since (I guess?) you did the JiffyDOS mod on this? Figure you know a thing or two about repairing C64s. It's been a while since I've done any soldering but it would probably come back quick, but I'd want to practice first. Obviously goes without saying that if I were to go the self-repair route, that is all at my own risk. Still considering the idea anyway. First off, regarding that last paragraph, I want to emphasize right now that I never even got around to trying to replace the ROM. Even now as I write this. The Commodore 64 system he sold me has sat entirely unmodified by me from the time he sold it to me until today as I write this very post. The most I've done with it is plug it in and power it on to try using it normally. Anyway... he seemed positive about this course of action and even offered to send me a replacement BASIC ROM and Kickman cart. Note that I didn't ask for this at all, he was the first to offer it. In fact, when I received his message offering to send me that stuff I was in mid-search looking for places where I could buy those items. I accepted his offer and that was that... for a while. I continued to do a bit of reading on the side now and then while waiting for the package to arrive. 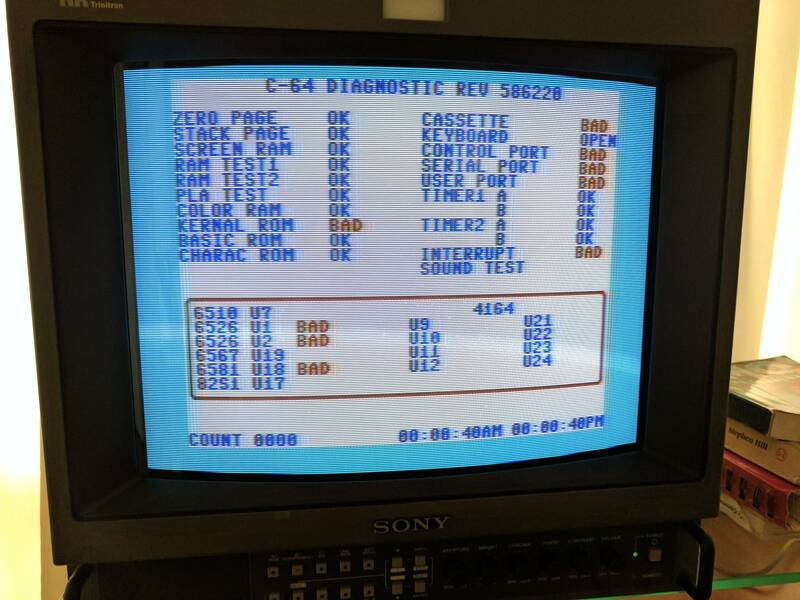 I eventually read about diagnostic cartridges that people had created for diagnosis hardware issues with Commodore 64s. I ended up buying one from COREi64 figured that it would probably be much more useful to have then having to guess at what is wrong from weather a Kickman cart does or does not boot when it arrived. On May 25th, I received another smaller package from him, but didn't get a chance to open it until the 27th. The diagnostic cart I had bought also arrived that same week luckily. When I opened the package szubaark sent, I found 3 EPROM chips, a BASIC ROM chip and a Kickman cart. There was a note included which said "some spare EPROMs for you :)". I have no idea why he would send me spare EPROM chips. I don't own an EPROM programmer, nor had either of us even mentioned anything about EPROMs in any of our correspondence to that point. Him sending me EPROMs was ultimately not helpful at all and served no purpose. Confused, I plugged in the Kickman cart and turned on the Commodore 64. It booted straight to Kickman as one would expect, though the audio was not working 100% right. There was a somewhat loud constant tone that never ceased right from bootup. The game's sounds would continue to play over it, but clearly it was not working perfectly. Ignore the "bad" test results shown on the right. They show bad because I do not have a test harness hooked up that is required to test those ports. The only test results that really matter are the ones on the left and bottom. So we can see that eventually the BASIC ROM did also come up as bad, and that now also the PLA was coming up as bad. Also the fact that the tests seemed to "get worse" as the system was turned on for longer seemed to prove that at least some components were probably failing at least in part due to heat (maybe?). At least that was one of my theories. Certainly heat does seem to be a common cause for a PLA failure. And if szubaark's lousy testing was only comprised of a 30 second power on test or something similar, he definitely would not have noticed a problem. Thus bringing me back to my original conclusion that he did not at all thoroughly test a 35+ year old "tested and working" Commodore 64 before selling it to me. The cart and rom chips you sent arrived the other day and I finally had a chance to try it out today and the cart did boot fine, though the audio seems off compared to what I'm seeing from looking at Youtube videos of the same game. There is a constant loud tone that never goes away (and is there immediately from power-on), but the rest of the game's sounds play fine despite this. Ignore the casette, control, serial, and user ports as from what I understand they'll show as "bad" simply because I do not have the diagnostic hardware hooked up that is required to test those. However, the remaining tests are pretty grim. The Kernel and BASIC ROMs are bad, in addition to the PLA, CIA and SID. (Please note that at this point I've NOT touched the replacement ROM chip you sent, I've done no modifications to the C64 at all and it has simply sat in a box since the day it first arrived and I discovered the problems with it originally). Frankly this seems to be a lost cause. It's obvious that there are numerous issues with this C64 you sold me and I'm sorry to be blunt, but I seriously call into question the quality of your pre-sale tests. I'm going to have to scrounge around for other C64's looking for replacements which is not something I really wanted to be doing from the get-go at least. That was the whole reason I was willing to pay your somewhat-above-average price for a tested and working unit. Please confirm for me if the return address on the package you sent is ok for me to send back the Kickman cartridge to. How can u have bad pla when the cartridge boots? Again how can u have bad pla.kernal.cia when the computer boots fine now with kickman cartridge? At this point I was seriously starting to question his knowledge level when it came to Commodore 64 repair and modding. He had some correct information, but even I knew he was saying some incorrect things, probably because he was starting to realize he had sold me something that he had not tested that well (or perhaps not at all). That board shown has a (imo crappy) EPROM PLA replacment as well as a SID replacement. I'd be quite mad if I got that in an ebay sale for a fully working unit. It basically has a old junk SwinSID SID chip replacement and a not-fully-compatible PLA replacement chip in it. The Kernal ROM is also a hacked replacement. This may explain the problems you are having. You may want to contact the seller about getting a proper PLA chip (or PLAnkton) and a new kernal at the very least. That SID chip will work but not 100%. The KERNAL is hacked up for the JiffyDOS install. I bet the 1541 looks much the same. It's extremely shady to sell a C64 without disclosing that it has a fake SID. Given your situation with shipping, I'd open an "item not as described" dispute and ask for enough money back to get a real SID and good quality repro PLA. After talking with multiple people knowledgeable about C64 hardware and modding, I've received unanimous agreement that I should open an eBay case for this as an item "not as described" (defective) and get a full refund so there is overwhelming evidence that this is the case. I was not aware that eBay's policy was that the seller pays full shipping in this case (see http://pages.ebay.com/help/policies/money-back-guarantee.html). However, I don't think that's necessary IF AND ONLY IF you're willing to pay for replacement chips that are all obviously not working. Since the diagnostic tests (which are not worthless as you claim, but do need to be taken in proper context) indicate that the Kernel ROM, PLA and SID have problems, I would ask that you provide a partial refund to cover the costs of getting replacements for these chips. This comes from multiple recommendations from my discussions with other people about this issue. Keep in mind that YOU advertised this sale as for a "tested and working" Commodore 64. It is QUITE CLEARLY not working. Not only that, but you explicitly advertised working sound and shipped it with a SwinSID without mentioning so, which is pretty sketchy honestly. SwinSID is not well regarded and I suspect that that is exactly why you didn't mention it in the auction description. I'm not willing to do a bunch of back and forth with you on this. The solution I've provided you with is cheaper than you paying for my return shipping. I am probably foolish for offering you this alternative, but I figure it will save us both a lot of time. If you provide a partial refund for the amount indicated above, I will leave you positive feedback and that will be that. If you refuse I will be forced to open an eBay case. If I don't receive a response from you in a couple days, I will also then be forced to open an eBay case. Again, this is really not one of my better moments. It reads more like a demand then anything. I don't think what I was asking for was unreasonable at all considering that if I had done what I should have done right from the start, he would have had to pay more then what I was asking (the return shipping would have been a fair bit more than the amount I quoted in my message). However, there is a correct way to ask for that and then there is what I wrote above... not good. Unbeknownst to me, this message of mine was actually against one of eBay's policies: feedback extortion. We'll come back to that later. Look im trying to be nice here. I already send you extras such as extra chips and cartridge. Now you asking me to send you even more chips(money). I never did any modifications to that computer except FIX It and added new power supply. The Sid or as you call it swinsid and pla were already there. All i know you could have another defective commodore 64 and you trying to fix with me paying for it. I have 100% feedback on my sales so when you started complaining i realized you could he trouble. You keep asking me to ship you extra chips which i did and now asking for refund money.. I'll give him that he did always come across as nice-ish. I was the only one of us writing mean sounding messages, though frankly, given that he had sold me a broken Commodore 64, I feel at least a tiny bit entitled to have a bit of a bad mood. I think any disgruntled customer would feel the same. But even still, I was going overboard in some of my messages and I do feel badly about that. That said, this first reply of his does not inspire me with confidence. He now claims that he didn't do all of the modifications that are present in this system and seems to not even know what one of the modified chips (a SwinSID) was. Which is obviously a lie I found out as a bit later a user on Lemon64 found an old post of his which clearly shows he does in fact know what a SwinSID is and seems to just be trying to play dumb here. Then he continues on now trying to blame me for breaking it. Wow. I should have honestly expected it from the way his very first message to me started (quoted near the beginning of this post). He mentions his 100% feedback rating, and honestly based on my experience with him and how he was trying to deflect blame, I honestly had no idea how he has maintained that rating. Luck, I imagine. Well, actually, he did really give me permission to open it up. Even though I never actually got to the point where I was going to do the BASIC ROM replacement, we had both discussed it and agreed that that was the correct course of action and he had offered and then willingly sent me a BASIC ROM chip so I could replace it! If I was not supposed to open the Commodore 64 up, then what was I supposed to do with the ROM replacement had sent me? Just sit there and look at it? There isn't exactly any complex mental gymnastics going on here to arrive at this conclusion, this is all pretty simple stuff I think! And actually he is kind of wrong when he says he didn't state anywhere in his description about modded chips. The auction was clearly for a system with JiffyDOS installed, which is by definition a mod and must be installed via a modded chip. Again, this is not rocket science here. He's really reaching low to try and shove the blame back on me. This is a hobby for that allows me to buy other Commodore hardware like cmd harddrives and you really need to stop sending me messages every week asking for more stuff or money.. I sent him exactly one message asking for money. He also sent me the BASIC ROM and Kickman cart for free and without me requesting it. When he offered to send it to me I was already googling around for places I could buy them from. And aside from an overly nasty tone as I've mentioned previously that I'm not proud of, I actually think that my request for a partial refund was not unreasonably considering that I was well within my right to request a full refund which would have cost him more. The only things I ever asked him explicitly for was a partial refund to repair the broken chips that were not working in this "tested and working" Commodore 64 and also for confirmation of his address so I could return the Kickman cart to him! (see a bit above if you missed that part in one of my responses to him). I never got that confirmation by the way. So I ended up opening a case for an "item not as described." Then about 40 minutes later I stupidly closed the case. I had mulling over it and was feeling really angry overall at how szubaark had been trying to shift the blame back on me to weasel his way out of this. It suddenly occurred to me that even if I did initiate a return he would probably eventually receive the returned package and make up something along the lines of how I broke it somehow or switched it with another broken Commodore 64 or some other made up thing and initiate a claim himself with eBay. Basically, I figured a return would just start a whole bunch more issues. So I closed the return. I then left him negative feedback and even managed to squeeze in a URL to the Lemon64 forum post I had made describing the whole ordeal. And that was that... or so I thought. Every couple days, I took a peek at his eBay feedback page to see if he ever posted a response to my negative feedback, figuring that he would and try to claim I had broke it instead and it was all my fault or something. Well, yesterday, I discovered the feedback I left him had been removed! What? I called eBay to find out what had happened. I found out that he had reported me! The irony! I don't know exactly what he reported me for, but eBay's findings were that I had violated their policy on feedback extortion. I guess technically I had given that really terribly worded message I sent to him, but I find it really quite disappointing that eBay will essentially allow a seller like szubaark who had obviously sold something "not as described" get away with it scot-free. I don't know how eBay looks at user reports such as in this case, but it does seem like cherry picking key phrases out of context and "resolving" the case prematurely. Well, that is that then. Nothing more to be done. As I said above, I can only hope that at some point in the future someone either a) does a random search by name for this guy and finds my post before decided to engage in a transaction with him and ultimately decides not to, or b) learns something from my experience about how to better deal with cases like this as a buyer: When you buy something and it arrives broken or otherwise "not as described" don't entertain the idea of fixing it or any other alternative. Return it and be done with it. Save yourself the headache! This post has been extremely long and I honestly hope to never post anything like it again. I've been an eBay user since 2003 and this is the first bad experience I've had on it. Strangely, I actually do think I feel better for having written this all out even though it ultimately will accomplish nothing. Or maybe lightening my mood was the whole point after all. Heh.